This projects explores the generation of additive geometric construction. The artifact will exhibit rudimentary functionality and is informed by per-determined set of criteria. 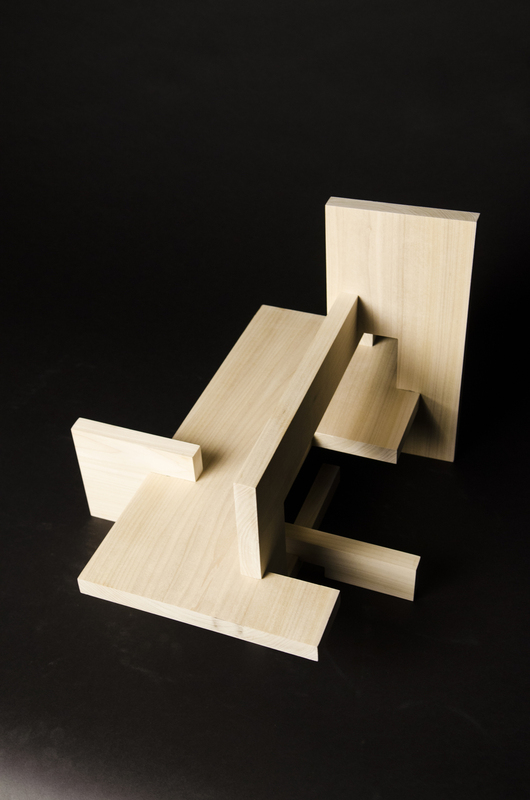 The design and construction of a rectilinear form that has four planar components. The study is also a practice in carpentry skills in creating flat surfaces, components perpendicular to each other and interlocking joinery. The foot stool is composed of 4 planar elements with only right angle relationships. A focus on the inherent qualities of the materials, in this case wood, is needed to create a beautiful balanced form that is also structurally stably.The project started with orthographic sketching then moved into sketch models at quarter scale. Quarter scale models then advanced into full scale models to help with the details that can only be seen at full scale. The final artifact was crafted out of poplar wood with accompanying orthographic and isometric technical drawing.